And then I got stuck on intimidation. These women are no joke and I started to question what value I would bring to the conference. I took another look at the advertisement for the Black Enterprise Women of Power Summit in the magazine, and the theme was “Embrace Your Power”. I saw it a million times while making my plans to attend the conference, but at that moment the importance of the theme nudged me in the arm like a sharp elbow. 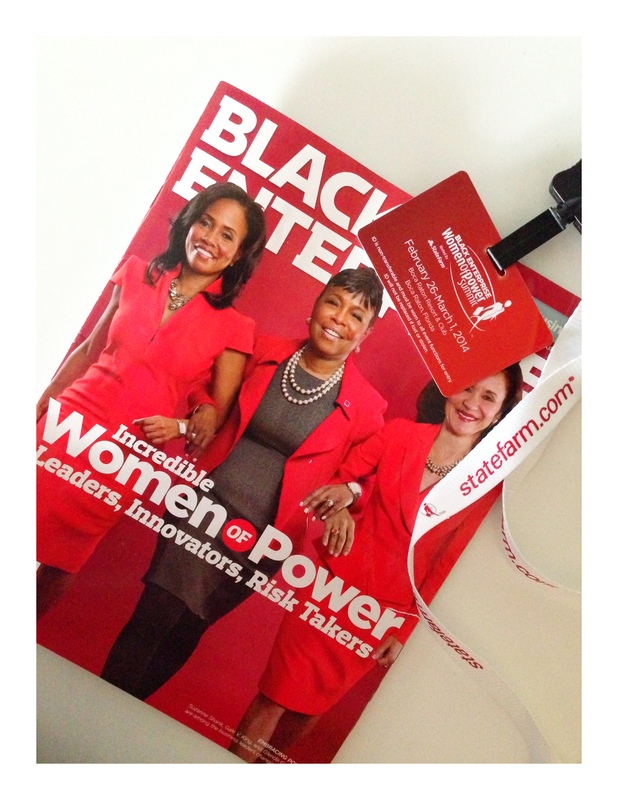 Right then and there I knew that the Black Enterprise Women of Power Summit was right where I needed to be. Little did I know that nudge would soon turn into a supportive embrace. As Black History Month transitioned into Women’s History Month, the end of February and beginning of March was the perfect time to hold the 9th annual summit which brought together powerful women of color in leadership. Over 600 participants representing all industries gathered for networking and personal development. The event kicked off with the Legacy awards dinner celebrating activist and author Myrlie Evers, actress Cicely Tyson, Executive Director Julieanna Richardson, Valerie Daniels Carter and Marian Wright Edelman. These women shared their personal stories of triumph, strength, and determination while stressing the importance of reaching out to others to pull them up and support one another. I cannot stress how important it was to have this epiphany. We are so conditioned to compare ourselves to others and we are bombarded with images of women tearing each other down over trivial matters. We succumb to antiquated archetypes associated with being strong black women that we forget how important it is to have and rely on a support system, both our careers and personal life. Without this, it is surely lonely at the top. During a breakfast session Myrlie Evers challenged us to focus on “the dash” and the legacy we choose to leave behind. What will we be known for? What is our impact? In our life’s journey we must not confuse being Human Beings with being Human “Doings”. Her raw honesty about her mission to bring her husband’s assassin to justice was riveting, especially when juxtaposed with her many professional accomplishments that cement her own place in history. The summit was an incredible opportunity to celebrate our authentic selves in a nurturing supportive environment where competitiveness and gamesmanship gave way to fellowship and mentorship. While many of us did not know each other, we all shared experiences, tips, book titles, and mobile apps to fortify us on our journeys to develop our careers, our passions and our legacies. While this is a departure from my normal posts about art, fashion and music I will continue to share some of the lessons I learned from the conference. Stay tuned for some additional “Power-UPs” that I picked up during the conference. Important message…looking for to hearing more! Thank you for sharing. Thank you for reading! More to follow!